Hand-delivered in a chic glass cube, this extraordinary bouquet of snowy-white blooms and fresh greens is a modern winter gift. 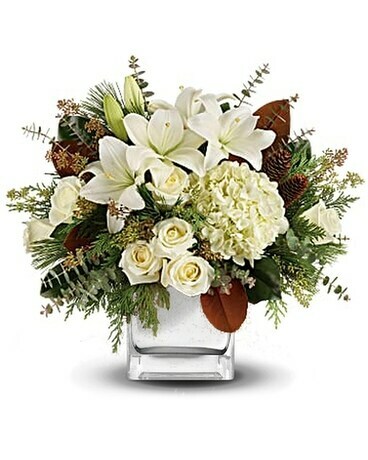 This winter bouquet includes white hydrangea, white roses, white asiatic lilies, magnolia leaves, seeded eucalyptus, spiral eucalyptus, flat cedar and white pine. Delivered in a clear glass cube.